Greetings again from the darkness. R.C. Sheriff wrote this 1928 play based on his experience as a British Army officer in WWI. The play’s successful two year run led to a 1930 big screen adaptation directed by James Whale and starring Colin Clive – two legends of cinema who also collaborated on FRANKENSTEIN and BRIDE OF FRANKENSTEIN. Now, exactly 100 years after “the Spring Offensive”, director Saul Dibb (THE DUCHESS, 2008) delivers screenwriter Simon Reade’s version of Sheriff’s story and a tribute to those who served in the Great War. It’s the Spring of 1918 and a stalemate in the trenches of Northern France has occurred during the fourth year of the war. 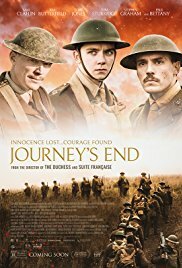 Fresh from training, a baby-faced Lieutenant named Raleigh (Asa Butterfield, HUGO) is assigned to a front line unit whose commanding officer is his former school mate, Captain Stanhope (Sam Claffin, THE HUNGER GAMES: MOCKINGJAY). The others in the unit include Trotter (Stephen Graham), who eats and talks incessantly to mask his anxiety; Hibbert (Tom Sturridge), who suffers from shell-shock; Mason (Toby Jones), the cook who brings subtle comedy relief: and Osborne (Paul Bettany), the heart and soul of the team. Slowly cracking under the untenable pressure is Captain Stanhope. His coping method involves a problem with whiskey which drives his raging temper. That temper masks a not-so-obvious commitment to his men … men who walk on eggshells around him. Most of the movie takes place in the dugout over 6 days, and though the soldiers spend much time in a holding pattern, the battle sequences involve an ill-planned surprise attack on a nearby German hold, and of course, the famous battle that kicks off the Spring Offensive – a 3 month run that cost the lives of more than 700,000 from both sides. With military orders such as “hold them off for as long as you can”, this is no romanticizing of war. Bravery and courage in the face of likely death are balanced with overwhelming human emotions. Confusion and disorientation abound as bombs explode in an environment that offers no place to hide or escape. The war ended later that year on November 11, and trench warfare would never again be the predominant strategy. This entry was posted on Thursday, March 15th, 2018 at 6:12 pm and is filed under Drama, War. You can follow any responses to this entry through the RSS 2.0 feed. You can leave a response, or trackback from your own site.